(1994), “D.P. 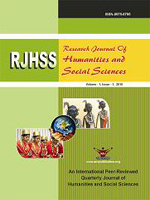 Mukerji”: A centenary tribute”, sociological bulletin, vol.43, no.2, September. Mukerji, D.P. (1924). Perspectives and the social sciences, Calcutta: the book company. Venugopal, C.N. (1998), Religion and Indian society: A sociological perspectives, New Delhi: Gyan publishing house. Singh, Yogendra (1986). “Indian Sociology”, Current Sociology, vol.34, no.2. (1945), On Indian History: A study in method, Bombay: Hind Kitab. (1994). “D.P. Mukerji: A Centenary Tribute”’ Sociological Bulletin, Vol.43, No.2, September. (1942, 1948), Modern Indian Culture, Bombay: Hind Kitab. T.K, and P.N. Mukerji (1986), Indian Sociology: Reflection and Introspection, Mumbai.